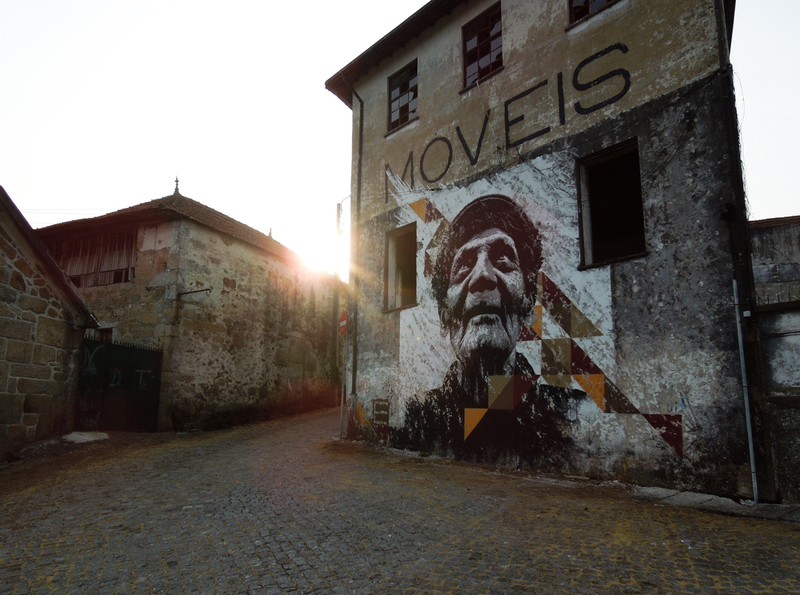 Since the early post revolution murals, in mids 1970’s, street art in Portugal has emerged from a mere political statement to a brand new expression of global and contemporary awareness brought by a fresh generation of artists. 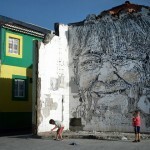 Although political murals have recently re-emerged due to the national’s economical downfall and total disillusion of politicians, it is nowadays more common to observe new movements or single acting artists trying to transmit a totally different set of messages while always trying to keep a touch of portugalidade, a national touch, doing this through a new approach of techniques, like the modern use of “azulejos“, the original portuguese tiles, or Portuguese inspired theme choice. 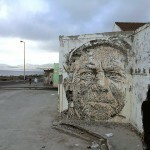 Although “arte urbana” continues to be generally viewed as marginal vandalism and a form of ruining private or public spaces – still as it is mainly composed of spray tags and poor graffiti – artists like Vhils, Eime, Paulo Arraiano or Add Fuel have emerged to give street art a all new meaning using innovative techniques (Vhils, for example, literally sculpts his works within the wall), giving a new format to traditional know-how (like the mentioned use of azulejos by Add Fuel), or displaying the more conventional methods like complex graffiti, paste-ups or stencil works. Unfortunately, most of the compositions of these artists continue to be almost totally unsupported, but there is hope in the horizon: since about five to six years now, major cities like Lisboa, Porto or Aveiro woke up to the new street art scene and started to endorse artists (Lisboa’s municipality created the GAU – Galeria de Arte Urbana to promote the urban arts) and sponsor events that gradually change the mind set of general public about what street art really represents, allowing simultaneously some artists to stand out. 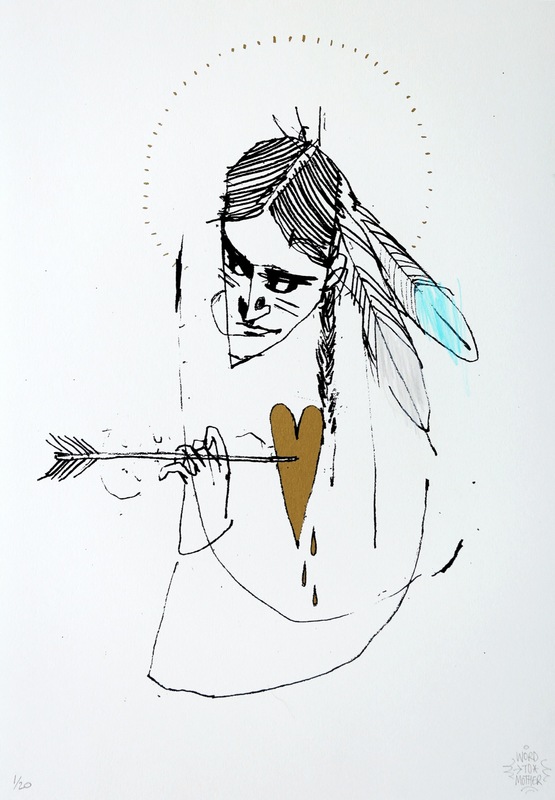 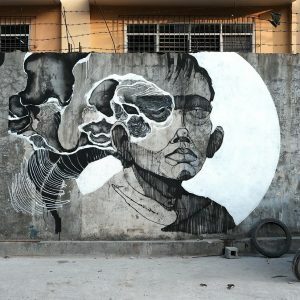 In 2011, for example, GAU made it possible to renowned foreign artists such as Conor Harrington, Brad Downey, Momo or Bastardilla to leave their mark in Lisboa, while boosting the work of national artists as well. 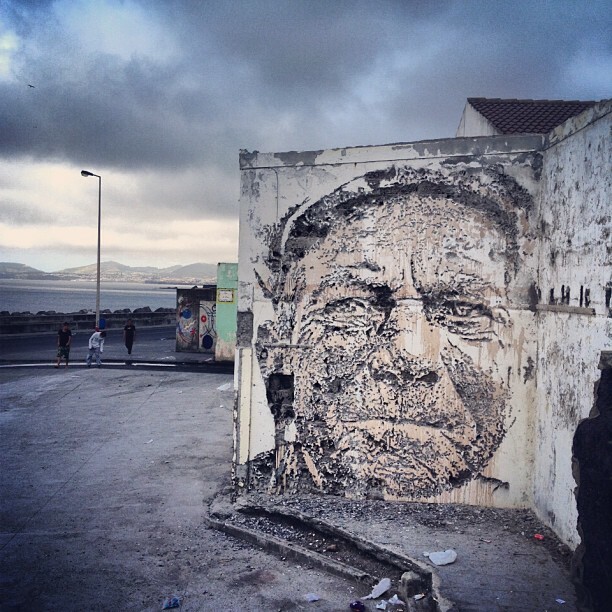 Other events are privately organised and evolve most of the times solely thanks to the strength and determination of a small group of individuals, like Walk&Talk that is held since 2010 in São Miguel’s island, in the Açores, an event that has been growing and counted, in this year’s edition, with the presence of world artist like Los Angeles collective Cyrcle, Nespoon from Poland, France’s El Tono or Pelucas from Spain. Other events like Fusing Culture Experience, in Figueira da Foz, or Putrica, in Freamunde, try to integrate street art among others activities such as gastronomy or sports making it accessible for otherwise uninterested crowds. 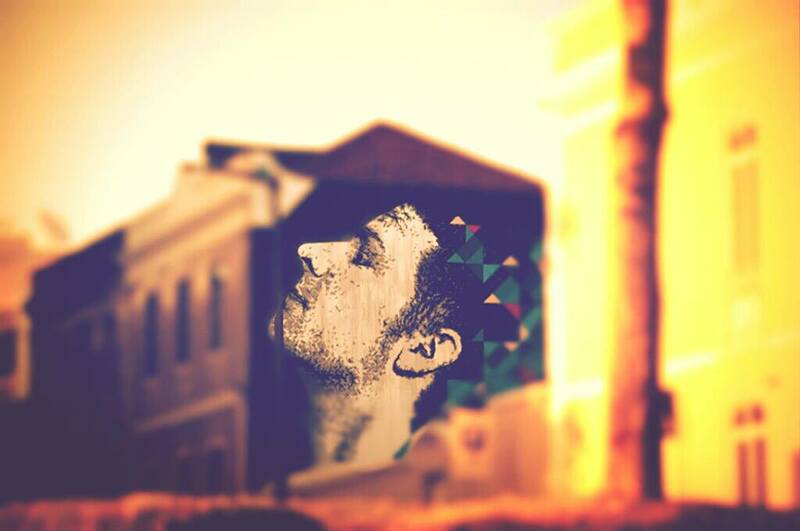 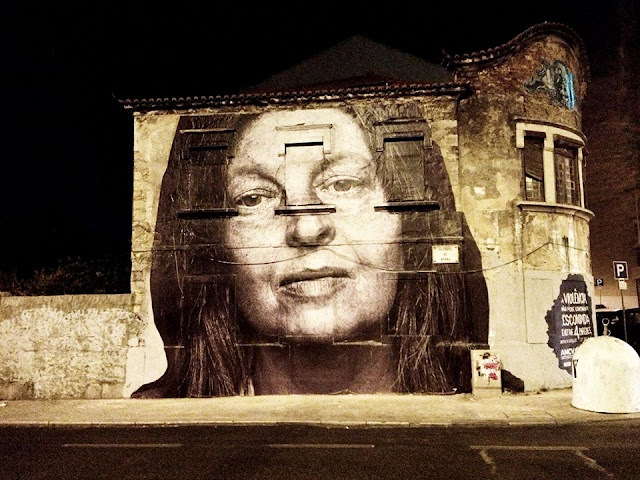 The growing awareness and acceptance of street art is such that recently a campaign against domestic violence, mentored by Rui Soares of Tailors agency, displayed large scale paste-ups pictures of battered women in some Lisboa’s buildings. 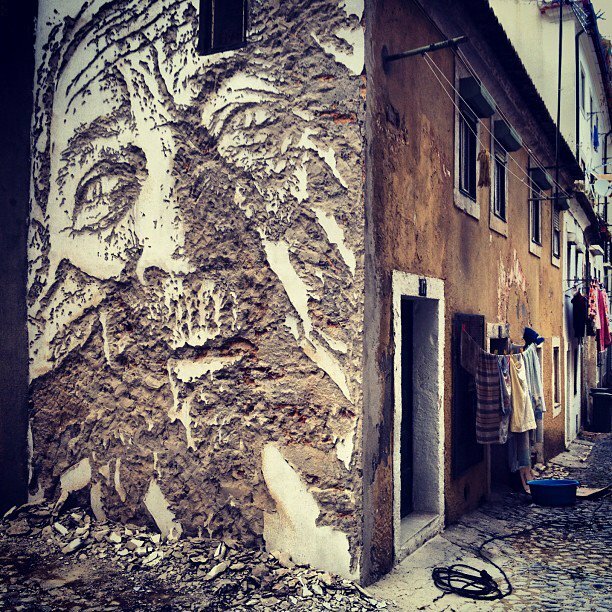 The active participation of Portuguese artists in street art focused events, in Portugal or abroad, also promotes the contact with artists from other parts of the world, encouraging an effective exchange of experiences, cultures, techniques or ideas about the art they all love. 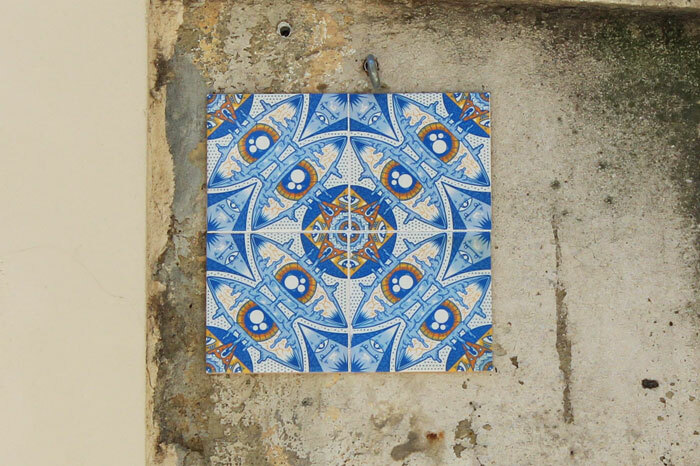 The gradual evolution of street art in Portugal only benefits from it. 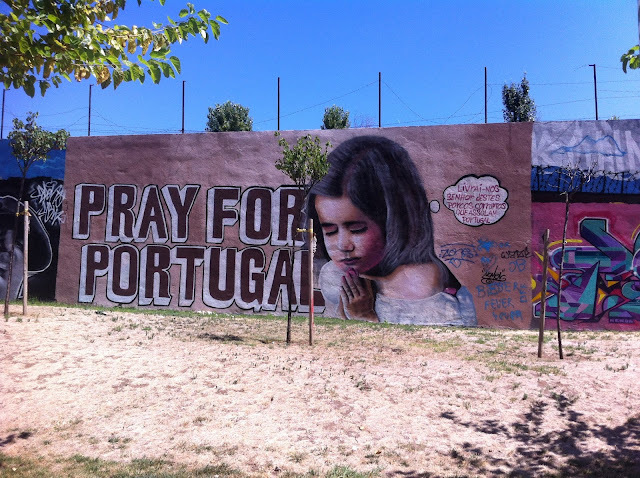 Regrettably, being Portuguese is also to usually give more emphasis to international art and artists than our own and, by being so, it is normally easier to “outside” artists to get the back-up and endorsement they need than Portuguese ones. 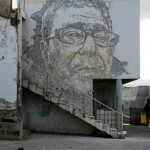 This situation has somehow to change in order to rightly promote “arte urbana“. 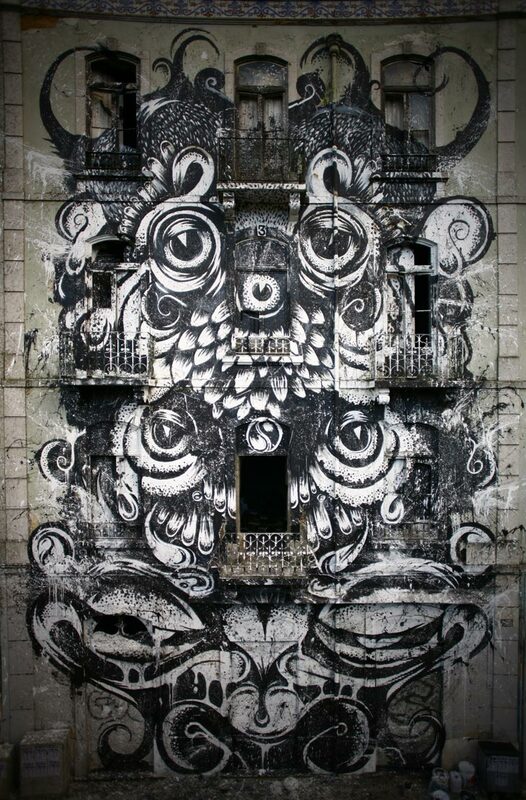 There is a long road that lies ahead for street art in Portugal, but the gradual and general recognition of artists like the ones we mentioned and also the continuous and prolific work of many unknown others that are still marginally working alone in the streets at night, surely inspire them all to continue their street art labour of love. 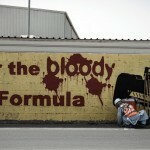 At least, that’s what we are all hoping for. 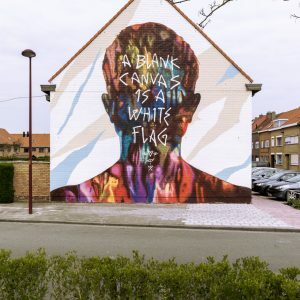 Footnote: Special thanks to Daniel Eime and all his help and input on writing this piece, keep on the great work and Rui Soares of Tailors agency, keep on betting on street art and its artists.